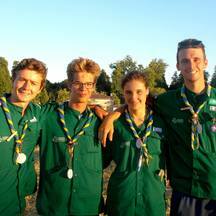 We are a team of four young people, members of the "companions" branch of the Scouts et Guides de France. We are called Ariane, Thomas, Adrian and Etienne. We are going this summer on the island of Chios, Greece, to help the teams of the NGO Caritas, whose French section is Secours Catholique, and which host a refugee camp threre. We are all four 18 years old. Ariane is in first year of medicine studies, Etienne in bachelor of economics and political sciences, Adrian is in first year of preparation ECS and Thomas passes at the moment his finals ! We have been scouts together for 12 years now, and this project represents an opportunity for us to put into practice the skills we have acquired in the animation, the management of groups of children and so on. Do not hesitate to send us a message if you want to know more about us, we will be delighted to be able to exchange with you to give you all the necessary information! Support our solidarity project in Chios this summer !